For a limited time, Leica Microsystems is offering $15,000 instant savings on the purchase of a Leica SCN400 or SCN400 F and SL801 autoloader. ● Do more with less � scan brightfield and fluorescence images, and automate slide scanning and analysis with an autoloader and SlidePath/Digital Image Hub software. ● Access anywhere, any time � with optional Digital Image Hub, access "virtual whole image slides" on the web for sharing & analysis with other pathologists locally and globally. ● High throughput for increased revenue � increase your scanning efficiency or streamline your fee-for scanning services; the high-capacity SL801 combined with the speed and accuracy of the SCN400 offer optimal solutions for high-volume scanning environments. (1) We are reorganizing our Books pages to fix some formatting errors and provide a cleaner look. Some small categories will be merged into other categories. We are eliminating the "discount" page, because Amazon.com changes prices daily and we cannot keep this page current. We will be adding images of book covers over the next several months. (2) We are combining what were 3 parts of the Soft Tissue chapter into one. Its Table of Contents contains most topics, and at the top of the page, there is a link to the remaining topics. (3) The Appendix chapter has been updated, based on a review by Jaleh Mansouri, M.D. We have also recently updated these topics in our Stains and CD Markers chapters: Cathepsin B, CCR3, Factor XIIIa, hCG, HMB45, HPV, LMO2, MUM1, Uroplakin III, Vimentin. We are disappointed that PubCan.org now appears to be a subscription site. One would hope that the purpose of the World Health Organization is to promote health, which is much more effective with a free informational website. (4) Thanks to Dr. Shrinivasan Chamarajan for contributing a video of the "falling leaf" motion of the Giardia trophozoite to the Stomach chapter, click here to view. (5) The Stomach chapter has now been updated, based on a review by Elliot Weisenberg, M.D., Chicago, Illinois. 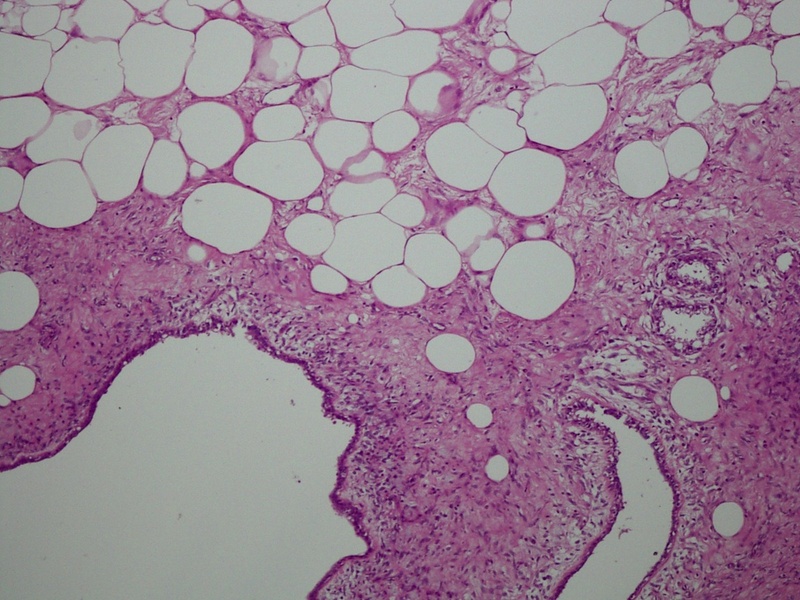 A 30 year old woman presented with a painless 12 x 10 cm breast mass. 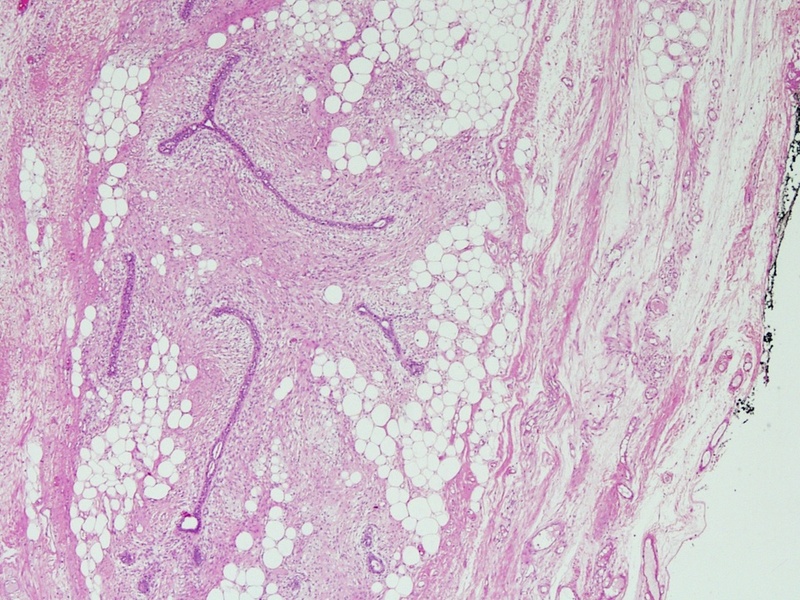 Adipose differentiation is an uncommon feature in phyllodes tumors, with few reported cases (Am J Surg Pathol 1994;18:720, Arch Pathol Lab Med 1994;118:91). 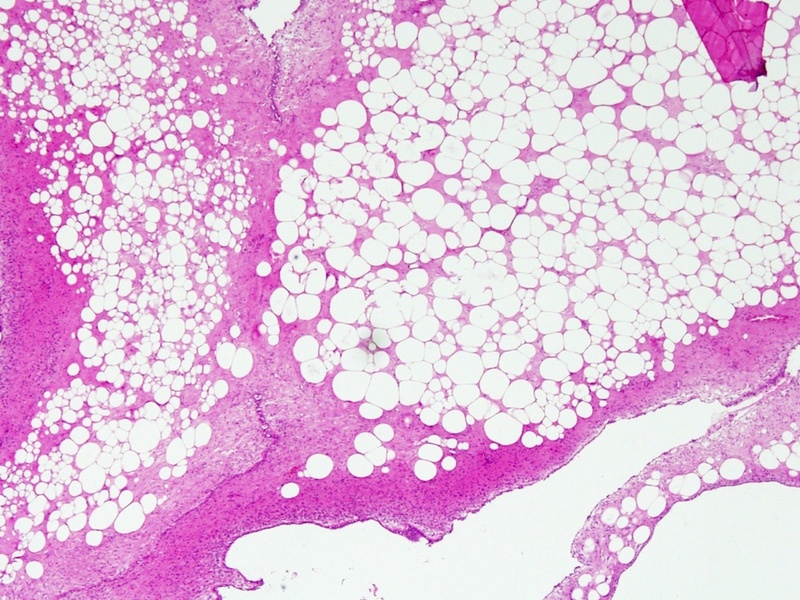 The adipose tissue component can be benign or malignant, resembling liposarcoma. In this case, no lipoblasts were identified, but the tumor had partially infiltrative borders, and 2-3 mitotic figures / 10 HPF. 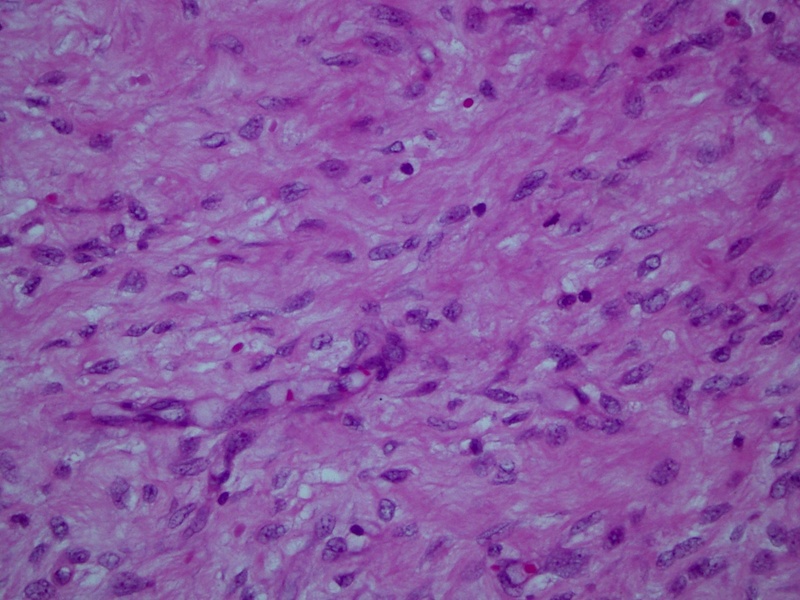 Phyllodes tumors in general are graded based on the presence of adverse features including tumor size, stromal overgrowth (at least one 40x field without epithelium), high mitotic rate (usually >10 / 10 HPF), sarcomatous stroma (with nuclear pleomorphism and atypia) and an infiltrative margin (Stanford University, Tavassoli: Tumors of the Mammary Gland (AFIP Fascicle, 4th series); 2009). 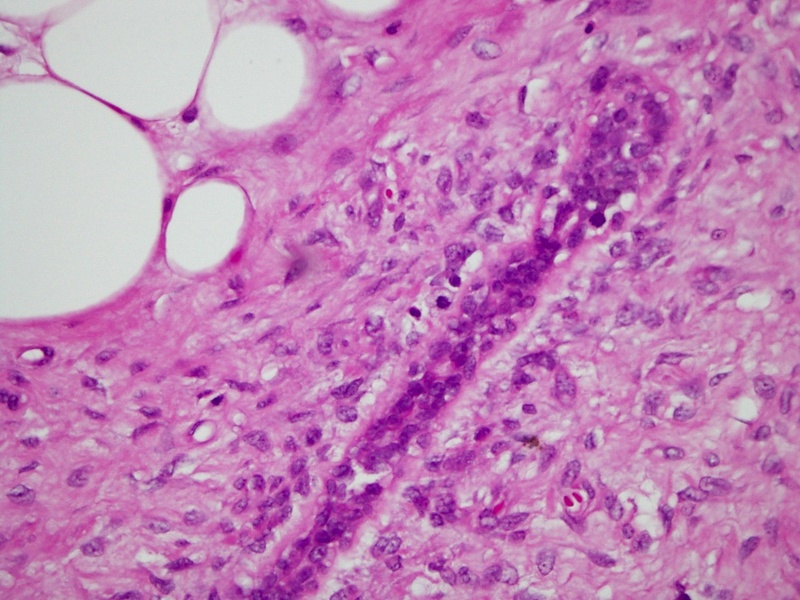 Tumors can be classified as benign, borderline or malignant, but many authors favor a low grade versus high grade system, because of the variable behavior of so called borderline tumors, and the variable use of adverse factors in determining the borderline category (Cancer 1996;77:910, Am J Surg 2006;192:141). Of note, borderline tumors cannot be differentiated from malignant tumors by genetic criteria (Mod Pathol 2007;20:435). For lipophyllodes tumors, it is suggested that grading be based on the morphology of the adipose component (Am J Surg Pathol 1994;18:720). 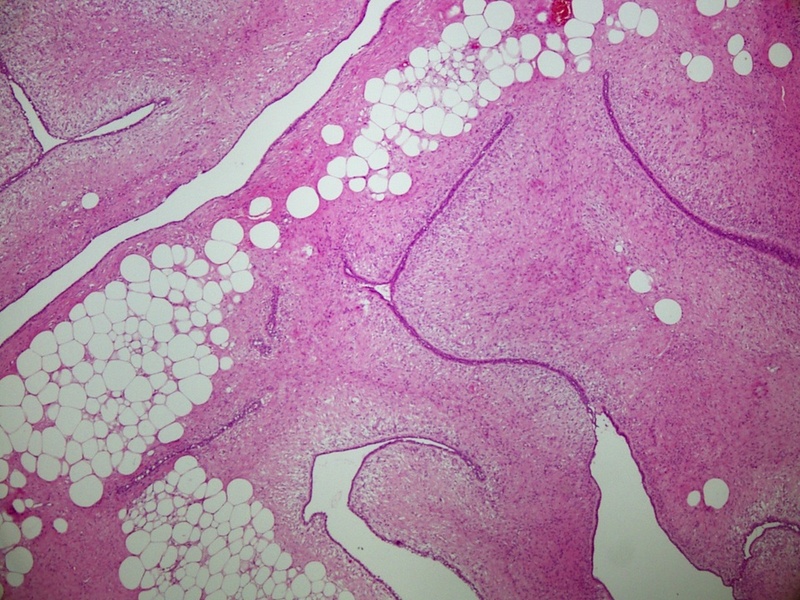 Even with a liposarcomatous component, patients had an excellent prognosis when the tumors were completely excised, even with high grade features.